Inskip 2 - the Fun! ...and every now and again you get lucky and photograph something you haven't seen before. While I was watching and photographing yesterday this bird flew up and caught a butterfly then came down to a branch just above me to eat it. Unfortunately this put it against the strong light - but it was worth a few shots and then later a bit of post-processing to lighten them up a bit. 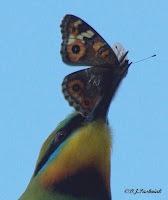 The bird had trouble getting the butterfly ready to swallow and at one stage even hit it on the branch a few times. Thanks to Neil for identifying the butterfly as a Meadow Argus. Earlier in the morning the fog was quite thick and still rolling over Inskip Point and out to sea. This photo was taken with the fog all around. The bird on the left is a juvenile without long tail shafts and with feathers that still look rather fluffy. Yesterday was a very interesting morning with a number of very frustrating incidents - and also some great ones which I will put in a separate post. I was walking very quietly along the bush track toward the sea at Inskip Point. The Point and camping place were crowded with vehicles and people! The only empty place was the bush track and there were a surprising number of birds calling. I was standing very still and trying to see what was scratching around in the brush close to the track when a great thrashing started in the top of the tree. Of course all small timid birds immediately took off! It sounded like an elephant falling! I moved enough to see what was happening and saw this Brush-turkey in the top of the tree and looking as if it wasn't sure how to get down. 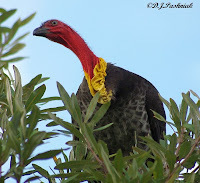 I've never seen Brush-turkeys either flying or up in trees before! I moved off and hoped for quiet. Further along the track there were more gentle rustles from the brush beside the track. The resulting photo is very poor indeed but typical of the frustration when trying to get photos of the elusive Black-breasted Button-quail! These people who say that the quail walk right out of the bush beside them have a whole lot more luck than I do! 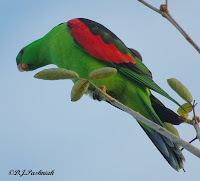 I frequently hear Red-winged Parrots flying over my place but they seldom come down. Maybe this is a good thing as a friend who lives only a block away was telling me what a mess they are making of the fruit on her trees. The other morning this beautiful male sat briefly in a tree at the back of my yard. I moved slowly closer and it didn't seem too worried. However, as soon as Misty my dog came around the shed it started watching her. At first it just turned its head but within a few moments the whole body was twisted around and watching the dog which was now under the tree. Parrots are so inquisitive! 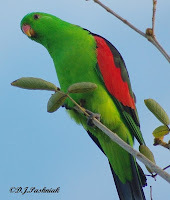 This is a photo of a female Red-winged Parrot taken some time ago. The juveniles are a very similar color to the females. A morning like this one is worth celebrating for itself, - but the real cause for celebration is that I went out in my kayak for the first time in 5 months! I just hope there are lots more days like this from now on. I went over to the shorebird roost on Crab Creek. This roost is in behind the mangroves that fringe the creek and has an interesting mix of sandbanks, mangroves and saltmarsh plants. Whichever way you look the light on the water is different. I counted 34 Eastern Curlews on the flats over there. During winter there are seldom more than half a dozen over there so I think that these are possibly some of the first migrants to return for the summer. There were two Pied Oystercatchers with them. There were also a few Bar-tailed Godwits (in numbers usual for over winter) and a lone Common Greenshank that made itself visible when it started calling loudly and then moved. 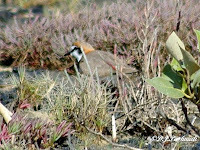 As usual there were numbers of little Red-capped Plover. These are very difficult to see as they are small enough to simply disappear amongst the saltmarsh plants if they stay still. Only when they move do you see how many are scattered across the flats. Yesterday felt more like summer than spring and the weather bureau is promising/warning that there will be no more cold weather this year! The plants in my garden are showing the same signs. The jasmine is covered with buds and will soon be covered with flowers. 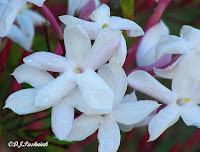 I think there's nothing quite so nice as jasmine perfume around my garden. My little Banksia rose has its first flowers just coming out. The flowers are tiny - about 10 or 12 mm. They are perfumed and even better the bush has no thorns. I have two bushes planted side by side. The flowers on one are white and on the other a creamy yellow. These are the most common birds in my yard. They are also the noisiest - apart from the Sulphur-crested Cockatoos which simply fly overhead screaming! I don't remember a day going by when some of them were not climbing over and through my grevillea bushes and checking out all the flowers for nectar. 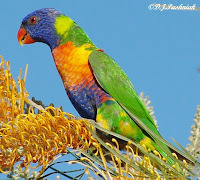 Duncan over at Ben Cruachan posted some great photos of the 'trouser's Rainbow Lorikeets wear! (Well worth a look!) Since the feathers on their legs are as brightly colored as the rest of their plumage its easy to miss how low down the feathers grow on their legs. 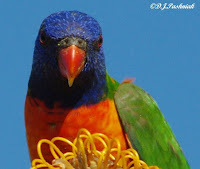 Rainbow Lorikeets don't seem to be a bit worried about you getting up close but they do keep a close eye on you! This bird has a flower right in its mouth but still has a eye on me as well. 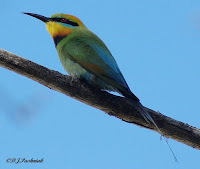 What could be nicer than showing another birder the great birding spots around your own area? Even better when the birders are from another country and appreciate everything they see! I had a most enjoyable morning yesterday showing off the beauty spots and the birds to a lovely couple from New Zealand. Thanks for your company John and Jackie! 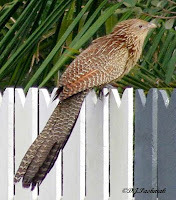 The morning started well when we spotted a Pheasant Coucal on the side of the road before we had even driven out of town. I had never before been able to get a photo of one of these. Then on to Seary's Creek, Bullock Point and Inskip Point. 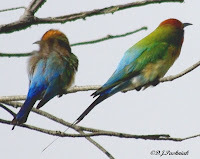 The birds were cooperative at some places and not so at others - that's always the way! It was a perfect winter day in Queensland and we finished off by a walk along the side of the channel leading out to the ocean at Inskip Point. There were not too many birds there but the sea had washed up some fascinating little creatures. (Thanks to Kel and Neil for the ID on these!) These little blue/purple snail shells all had a little bit of what looked like froth attached to them. When I touched it I found that the froth was more solid than it looked - almost like a little piece of bubble-plastic. 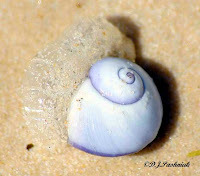 These creatures are called Violet Snails (Janthina janthina). The little attached foam is a bubble raft they secrete and which pushes them ahead of the wind on the surface of the water. This creature is more properly called a planktonic hermaphrodite gastropod! The other little creature was a By-the-wind Sailor (Velella velella). It is a pelagic colonial hydroid! These creatures also float on the surface of the water and the little sail pushes them ahead of the wind. Both of these creatures are only seen on the shoreline when there has been a strong wind to blow them on shore. 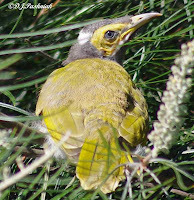 Yesterday I heard noises that sounded like a juvenile Blue-faced Honeyeater and when I went out to check the grevillea bush I found this little fellow. It looked as if it was not quite sure what to make of its new environment. 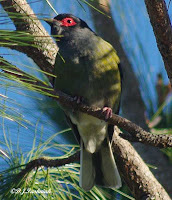 Over the last few weeks I have heard a Figbird calling in the big pine tree next door. 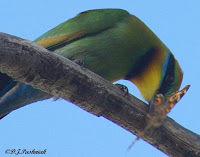 I have only seen one bird there and the photos I took are of a male bird. The male is most distinctive with its red eye patch. 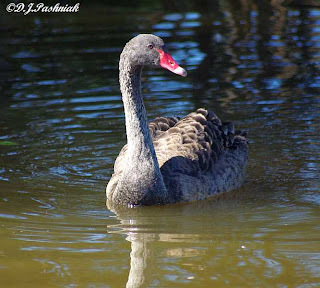 The female is quite a different color and instead of the red eye patch has a grey-brown patch. This one was sitting out on the power line beside the road. The video clip is of the male calling in the tree. In the background kookaburras are laughing. Over the last few weeks there have been a number of fires burning around us. This is part of the normal burning off at this time of the year. There are very large pine plantations to the west and National Park to the east and south. The bay (Great Sandy Strait) stretches off to the north. Without a 4 wheel drive vehicle I am not able to explore far inside the park but the areas I can see close to the road regenerate within a couple of years. The houses on the opposite side of the street where I live back directly onto National Park land so it is reassuring to know that not too much undergrowth is allowed to accumulate. This plume of smoke from one of the fires looked quite spectacular from out at Inksip Point the other afternoon. When I came home the smoke was to the west of me and the sunset was red and smokey. Yesterday while walking along the side of the bay this gum tree was in blossom. I have not noticed others with this pink and white color - usually just white. 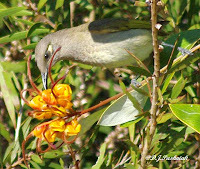 There were a number of different birds on the flowers but the only one to stay for a photo was this Noisy Friarbird. 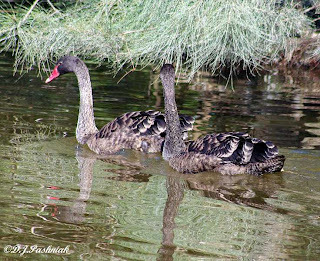 Juvenile Black Swans are almost as large as the adults but still don't have the glossy black plumage of the adults. This is a Watery Wednesday Post. These Brown Honeyeaters are quite common around my area but they are so small and fast that they are more often heard than seen. They start singing before it even gets light and have a very loud song for such a little bird. They have a range of calls including a very soft contact call that is like a tongue click. 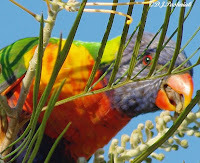 This bird is in an 'Orange Marmalade' Grevillea bush which is growing in a friend's yard. They were constantly flying in and then off again while I was watching and I managed a rather blurred flight photo as one flew off. 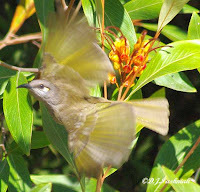 The video has the sound of the Brown Honeyeater. 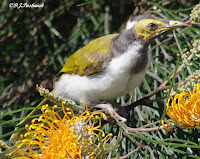 It was taken outside a friend's house which has a Paperbark Tree just coming into flower in the front yard. There was a Brown Honeyeater singing in the tree and another one answering from close by – as well as a dog barking somewhere in the distance! 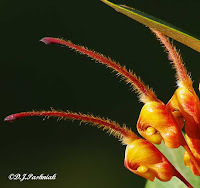 Some time ago Denis over at The Nature of Robertson challenged me to try some macro photography on some of the grevilleas in my yard. He also very patiently told me what to look for and gave suggestions about photographing. Thanks Denis for your help and encouragement. I now have a much better idea of the difficulties of macro work – even harder than photographing an LBJ! I also know from practical experience the limitations of both my lens and my own photographic technique. Again – practice and patience required! Grevillea 'Orange Marmalade' is a cross between G. venusta and G. glossadenia. 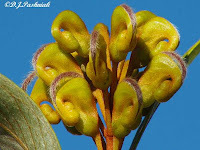 It is one of the group known as “cat's paw” grevilleas. I planted it less than a year ago in my garden because I saw the number of birds that it attracted to a neighbour's yard. 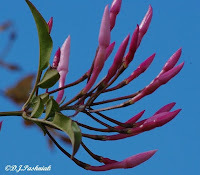 It is an open shrub which grows 2.5m tall by 2m wide. The flowers are certainly not as showy as other common grevilleas but the small birds seem to like it even more. The flowers are short terminal racemes. When they first appear they are a green color and the style is tightly tucked into the floral tube (perianth). In this photo the styles are just beginning to come out of the of the perianths. The top part of the flower has ones where the style is not visible at all. The styles are covered with long brown hairs and the leaf (on the lower left of the photo) is also covered with grey hairs. In this next photo the flower tubes are now an orange color and the styles are springing out of the perianths. The base of the style has tufts of brown and grey hairs. The style does not spring out of the perianth until it has been polinated from other flowers. This staged development avoids self-pollination. The styles stand right out from the rest of the flower and the perianth is now swelling at its base with developing seeds. Looking at the perianth from a different angle the anthers are clearly visible. The tufty hairs at the base of the style (top of the photo) are clear. A seed pod developing. The floral tube has all dropped off although the style is still attached. Unfortunately my photo skills were not good enough to show pollen on the presenter at the end of the style. I also could not find any fully developed seed pods on the plant. Maybe it is too soon to expect that, as it has only been flowering a little while.